The new iPhones are expensive, but there is a good reason to buy them from the U.S. instead of India. Apple’s special day arrived last night which included the reveal of three new iPhones and their pricing. While we may endlessly debate (just like every other year) how overpriced the iPhone may be, or how it's not a value for money device, bottom line is, Apple is still going to continue to have issues maintain stock of the new iPhones. They are still going to sell like hotcakes and even in India, as we grapple with the fact that the highest variant of each of the phones costs as much as a down payment on a car, it’s still not going to stop people from going out and buying them. Unfortunately, Apple has made it even less lucrative to buy the iPhone in India, which is a shame given the dropping market share the company holds in India. 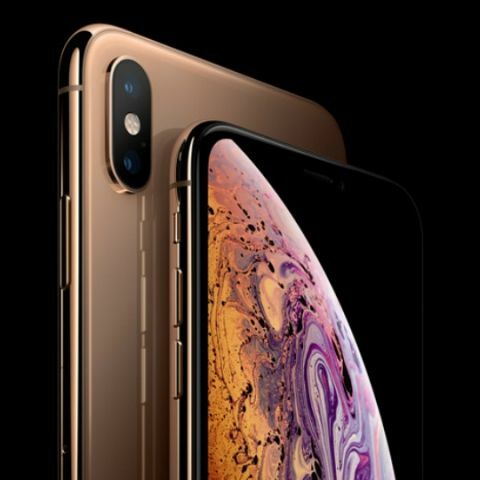 During the event, the U.S. pricing for the new iPhone trio was announced, with the iPhone Xs starting at $999, the iPhone Xs Max starting at $1099 and the iPhone XR starting at $749. In India, however, the three phones will have a starting price of Rs 99,990, Rs 1,09,990 and Rs 76,900 respectively. 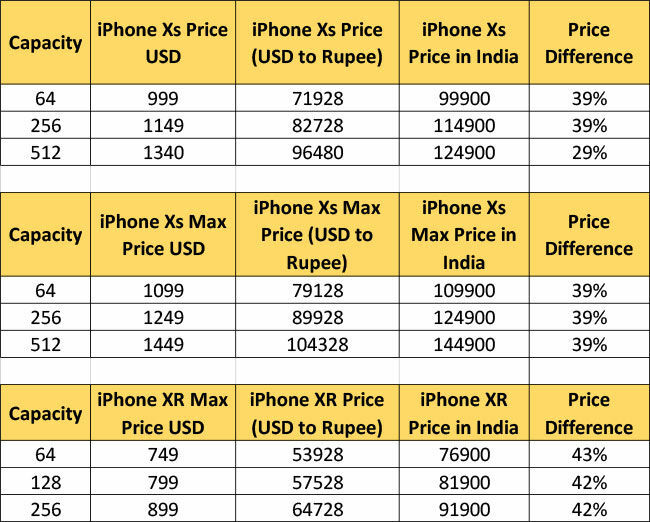 The table below illustrates the difference between the India price and the dollar price of the new smartphones converted to rupees using the current exchange rate of Rs 72/Dollar. The table also shows the percentage markup the Indian pricing has, potentially due to the import duties levied on the devices. As you can see, there is a considerable difference in price, and even if you were to look at the price of these phones in Singapore or Hong-Kong, India still manages to have a higher price tag. Of course, the iPhones are the cheapest in their home market. Up until last year, this price disparity was extremely bothersome, given that the warranty on these things was not valid outside the country of purchase. Lack of warranty can be a huge deterrent, especially if you’re spending so much money on a phone. Thankfully, Apple last year in October announced that they were going to make the warranties on the iPhone valid all around the world. This meant that you can buy an iPhone anywhere in the world, and claim warranty (and Apple Care services) anywhere else. This means that if you want to save a few considerable thousands on your next purchase, buying the iPhone from the U.S. would be the best idea. It would be interesting to see how the iPhone performs in India over the next year, given the new lineup’s exuberant pricing, paired with the fact that the iPhone now comes with international warranty. This could serve as an incentive for a lot of people to buy their choice of iPhone from other countries, which could technically skew the sales number in India. For example, it could be that there are a thousand new iPhone Xs units in the hands of Indian consumers, but only 60 were purchased here. Given that Apple has been facing a decline in sales in India, it would be interesting to see how the company tackles the issue going forward. For now, we wait for September 28 when the iPhone Xs and the iPhone Xs Max become officially available in India. The iPhone X R is expected to be available on October 26, starting at a price of Rs 76,900. Should I purchase the iPhone 5s or iPhone 6?